We take it in turns to do the first thing in the morning dog walk. Yesterday was my turn and the little beasts set up a mighty whimpering at 7.30 a.m. We know full well that at home they can sleep until after 9.00 without needing to go out to pee but it feels too risky to tell them to shut up and roll over for another hour’s kip in the motorhome. Today might just be the day that they are really desperate – so I got wearily out of bed, slung on a variety of mismatched items of clothing and staggered out with a hair do reminiscent of a hastily harvested coconut. I was awake by the time I’d walked half a mile along the sandy beach and the first good thing of the day happened. I found a golf ball lying in the machair – someone with a swing like Guy the Gorilla must have sent it from the 3rd tee high up on the hill. That’s the tee with the notice that suggests there is nowhere in the world better than this. I wonder if the guy who lost his ball still felt that way. Further along the walk I met a local man walking his two dogs. To my amazement, rather than the usual muttered chat about the weather that is the normal mode of conversation for dog walkers, he launched into a political tirade about the fact that the government can afford all kinds of unnecessary expense but they can’t afford to keep the public toilets open beside the beach. I didn’t know whether his outrage was because he was in dire need of the aforesaid conveniences so I tried to politely move on so that he could find a bush – but it seems I was wrong. He went on to list all the other things that the government should be funding including supplying dog bags for dog walkers and cleaning up the rubbish left lying around. He clearly had a thing about deposits. Back at the van after a grand breakfast we picked up our clubs and headed for our third and final day on the golf course. Traigh Golf Course is a 9 hole course that you play twice to get a full round. This is extremely convenient for those of us who need to use the conveniences along the way as you can pop into the clubhouse after 9 holes and take a short rest in their rest room. Unfortunately the halfway point was too far away for the girls who had drunk a bucket of coffee at breakfast so we had to use the conveniently placed bushes at the sixth. It was here that I found my second lost ball of the day – I was beginning to feel quite flush! At the end of the game the starter in the clubhouse asked who had won. I told him that we hadn’t counted so he said that he’d watched us at the 9th and Shirley had taken more putts. He then presented me with a new golf ball as a prize. There is definitely a theme going on – and it is also the very first, and probably only time that I will be presented with a prize for my golf. Staggering home I checked my fitbit and saw that I’d walked a total of 18k steps and it was only 2 p.m. No wonder I was knackered. After sitting staring slack mouthed into space for a couple of hours we decided to take the van off the pitch and go and have a look at Mallaig. Our ferry to Skye was booked for the next day and we wanted to make sure we knew where we were going. That’s the official version. The truth is I was hankering for fish and chips but I didn’t admit that until we got there and Shirley had seen other people sitting in the sunshine eating them. That way I could make it look like her idea. Why does food taste so much better when someone else cooks it and you can eat it outside? This fine meal was made even better by the fact that the fish was fresh off the sea and it was cooked to order. Completely delicious. Back at the van, parked alongside the harbour we saw a massive harbour seal surfacing and taking the air. Shirley remembered that seals are attracted to live music so she persuaded me to open a window and play my Irish Whistle that I’d bought as a substitute for my clarinet, which is too antisocial to play on caravan sites. She got out of the van with her camera encouraging me to keep playing, telling me that the seal was surfacing and listening. A few minutes later I looked up from my merry whistling to see that she had walked about half a mile away and left me sitting there alone in the van like a very shy busker. No seals to be seen either – do you think I’ve been had? Once again we were sad to leave as we made our way from our sea front pitch to the road to Mallaig and onto the Skye ferry. Waiting in front of us in the queue was another motorhome and as its driver got out we were overcome by the giggles. He was a complete Father Jack, of Father Ted fame, lookalike. Wild white hair blowing in all directions, baggy trousers and all. As we got settled on the top deck of the ferry in the sunshine we found that we were right next to him. I was disappointed when we struck up a conversation to find that he wasn’t Irish but a Lancastrian born and bred. He didn’t pepper his conversation with outbursts of the Tourette’s variety either. Shame. A quiet spot for the night? Landing on Skye we thought we’d have a go at finding a free spot for overnight parking. Wending our way from Broadford towards Elgoll on a single-track road we found two places that were ideal. 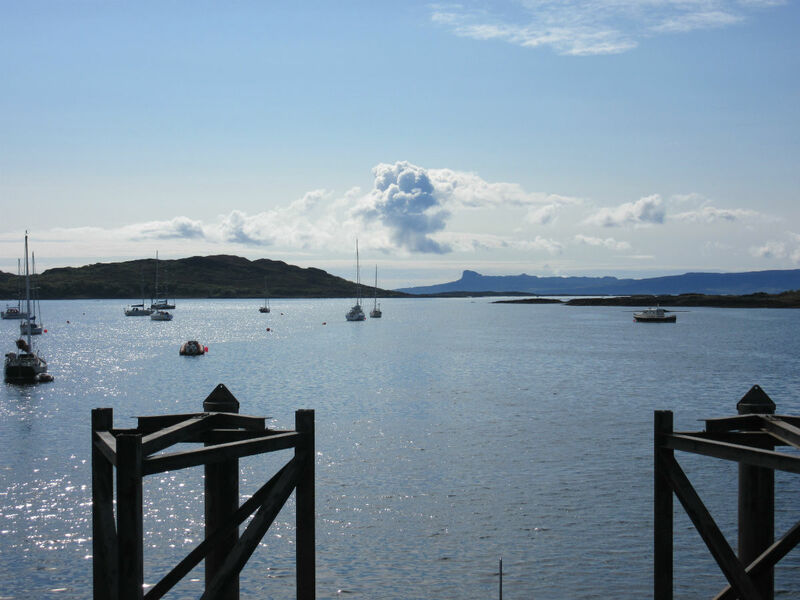 One, with a magnificent view of the Cuillins and the other, looking out over the sea towards Eigg and Rhum. The only problem was that it was only 3 p.m. and there was nothing to do but look out of the windows until bedtime and anyway, just before we’d turned off I’d spotted a rather nice ice cream shop with motorhomes parked beside it in Broadford. I started to broach the subject of the ice cream when Shirley uttered the following immortal words. “You know you’re secure in your relationship when your partner starts a sentence with ‘I fancy …’ and you know it’ll either be ice cream or chips.” She knows me too well. Back at the ice cream shop in Broadford, parked overlooking the bay, we indulged in a wonderful dollop of locally made chocolate ice cream. Next stop was the co-op for a few essentials. Standing in the queue in front of us a young man asked for cash back. The cashier, who was from Yorkshire, handed him the money, pointing out that they were all Scottish notes, “Is that ok?” he asked with a cheeky grin to which the local boy, who wins the day’s award for witty banter, replied, “May your death be quick and painless – that’s all I have for you.” and walked off with an ‘up yours’ toss of the head.